There’s an old saying that if you left a typewriter in a room full of chimps for 100 years, they’d write the Magna Carta. I say if you gave them a computer, an Internet connection and the same amount of time, they’d create a crappy MySpace page. There’s such a thing as too much technology. Just because it’s possible to place a purple unicorn, surrounded by sparkling stars, with “Dare To Dream” in dancing pink letters flashing at a seizure-inducing rate on a chartreuse background, doesn’t mean you should do it. Most MySpace pages are busier than a Tokyo subway. It’s widget overload, with spinning photo cubes, embedded video players, and annoying apps like SuperPoke clanging about on a page that’s too wide for my screen to display. Though it may be a bandwidth torture test, MySpace is still a great place to find music. Lately, I’ve noticed a few improvements that make it even better. I’d done little with my own MySpace beyond “friending” local bands, and encouraging them to “friend update” me with their events. When it comes to music, MySpace is the iTunes of social networking sites. But it’s long been a chaotic chore to actually find a band, even if you know their name. Now MySpace Music, the recently launched joint venture with the major labels, offers some spiffy new tools. A Top Artists search engine is perfect for locating area bands. All it takes is a zip code and a genre. A couple more clicks creates a list of shows. Best of all, it’s easy to make a music player with all my favorites so everyone can hear it for themselves. I know that Facebook is better for networking with people, but when I want to find a Friday night destination, these are the tools I need. The rabid community of MySpace music fans doesn’t hurt, though. Recently, Dave Van Guilder of Christopher’s Bar and Grill in Ludlow launched The Local Scene (myspace.com/localscene68), with links to a passel of area bands, promoters and producers, many of which are new to my ears. It’s not perfect, but MySpace is definitely improving. I haven’t seen a purple unicorn in days, and my personal playlist, located at myspace.com/localrhythms, is growing like crazy. So please friend me, or just stop by and play with my retro-cool embedded Beatles video widget. Friday: Hexerei, Imperial Lounge – Claremont’s heavy metal heroes have been busy laying the groundwork for a big at the golden ring. Their New York City-based management team landed them a spot on “Rock The Ink” a three-day celebration of music and tattoos later this month in Providence. 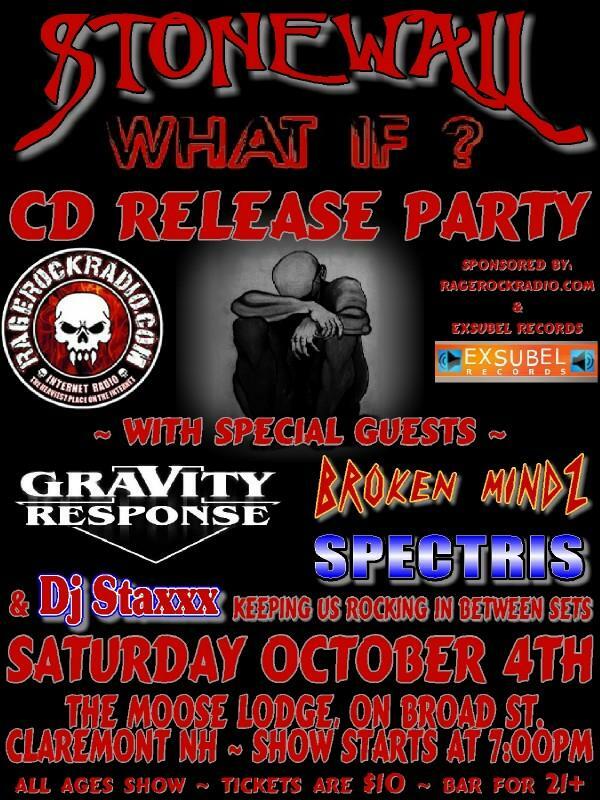 The show also features Sevendust and Godsmack, so good for them. Oh, and their “Paid in Full” CD is polished and ready – great news all around. Saturday: Xylem, Seven Barrel Brewery – Fans of the Grateful Dead should like this band, a four piece that blends folk, rock and grooves. They’ve played several times at the Goshen Pagan Fest. The existence of such an event surprised me; it might even surprise some residents of Goshen. It’s nice too see Seven Barrel returning to two nights of music a week. It’s a bit cramped at times, but always fun – plus, the beer is great. Sunday: Second Wind, Newport Bridal Show – I heard a comic the other day saying that there is no greater love in the world than that between girlfriends at their weddings. What else explain their joy in spending 500 bucks on the ugliest dress they’ll ever wear in? Anyway, I love the folksy duo providing the entertainment for this ladies only event – is that why it’s on a Sunday in the middle of football season? Monday: Old 97’s/Charlie Louvin, Higher Ground – What a double bill! The headliner is a high energy Americana outfit that hit a sweet spot in the mid-90’s. Charlie Louvin is a living legend that’s practically in his 90’s, who’s influenced many a player, including George Jones, Elvis Costello and Jeff Tweedy of Wilco, all of whom helped out on his eponymous 2006 CD. Wednesday: Jukejoynt, Wilder Club & Library – Dave Clark and Jed Dickinson play their original music in the performance space in celebration of a major accessibility project. Dave’s local music library at yellowhousemedia.com is growing every day – you should check it out. On March 23, 1969 a young guitarist, with a reputation as a hired studio gun on several of the best R&B records of the era, invited a group of musicians to his Jacksonville house for a jam session. Hours later, the playing was over, and every musician in the room was energized by the experience. But the original band would only exist for two and a half years, until Duane died in a motorcycle accident, four days after checking out of rehab. 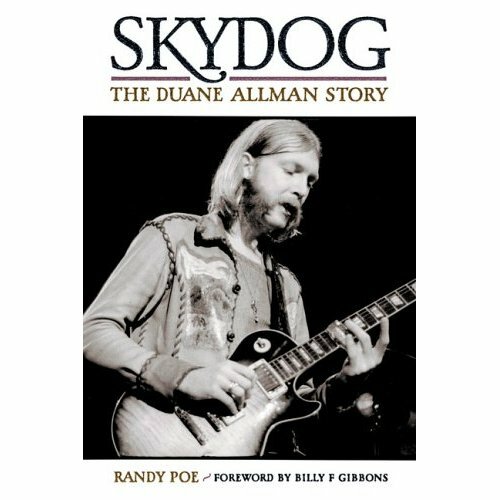 “Skydog” chronicles a story that’s been told before, in Scott Freeman’s “Midnight Riders – The Story of the Allman Brothers Band.” But what makes Randy Poe’s excellent biography a worthy addition to the canon is his focus on Duane Allman’s evolution as a musician. Poe largely eschews the band’s well-known tragic elements for a detailed look at the life of a single-minded performer who reshaped American music. The Allman Brothers were an interracial band in a segregated South, featuring two drummers when such a thing was unheard of. Their music hinted at jazz, but could rock like the English Invasion groups Duane and Gregg emulated with their first band, while staying rooted in blues traditions. No one had even imagined a sound like the Allman Brothers, until Duane Allman invented it that fateful day in March 1969. “Skydog” – the nickname was given to him by Wilson Pickett – shows that it wasn’t an easy road. With bands like the Allman Joys and Hourglass, Duane Allman enjoyed a reputation for flashy playing that made he and his brother a hit in the “garbage circuit” – clubs and roadhouses throughout the South who welcomed the band’s mix of blues and Yardbirds covers. Their first break came when recording sessions done with songwriting legend Jim Loudermilk led to a West Coast contract with Liberty Records, at a time when old time labels were trying to capitalize on rock and roll. The experience was a double-edged sword for Duane. On the plus side, his band frequently shuttled up to San Francisco for shows at the Fillmore West. There, they met concert promoter Bill Graham, and laid the groundwork for their legendary “Live at the Fillmore East” album. Duane also picked up slide guitar, after seeing Jesse Ed Davis play “Statesboro Blues” with Taj Mahal one night in Los Angeles. The Allman Brothers would later copy Davis’s arrangement of the song and make it famous. But Hourglass never found its musical voice, making two forgettable albums. Eventually, Gregg chose to work off their record contract in L.A., while Duane went home to look for studio work. His first stop was Fame Studios in Muscle Shoals; he’d made some friends when Hourglass recorded a blues-based album there (which Liberty later rejected). Studio owner Rick Hall told Duane he had plenty of hotshot guitarists on the payroll, but that he could hang out and see what transpired. Eventually, his work on Wilson Pickett’s cover of the Beatles’ “Hey Jude” – which Duane suggested to the incredulous singer – got him noticed. In short order, Allman’s distinctive playing was heard on records by Aretha Franklin, King Curtis, Arthur Conley and others. Later, he made his mark on Boz Scaggs’ debut, one of the first albums made at the now-legendary Muscle Shoals Sound studio. Soon, the Allman Brothers Band’s trajectory would begin in earnest. Two and half years later, Duane Allman was dead. Though his brilliance is to many fans a tragic footnote in the band’s 40-year history, “Skydog” makes clear that though the Allman Brothers could carry on in his absence, they would not have existed without Duane. The book also explores Duane Allman’s work with Eric Clapton – their mutual admiration society meeting, shared taste for excess during the making of “Layla and Other Assorted Love Songs” and Duane’s short touring life (three shows) as a member of Derek and the Dominoes. Poe breathes life into this seminal period of American roots music, and one of the era’s most important figure’s coming of age. That is incorrect. In a 3-page acknowledgments section, Poe thanks several individuals for their participation in the book, including ABB members Gregg Allman and Chuck Leavall. This reviewer regrets his error, and hopes that correcting the record within 24 hours of posting the article will mitigate the unfavorable impressions it caused. Too much time is spent on the already well-documented post-Duane Allman Brothers era. When he focuses exclusively on Duane’s music, especially through the insights of people like Rick Hall, Jerry Wexler and the various members of Allman’s early groups, “Skydog” is a solid biography.